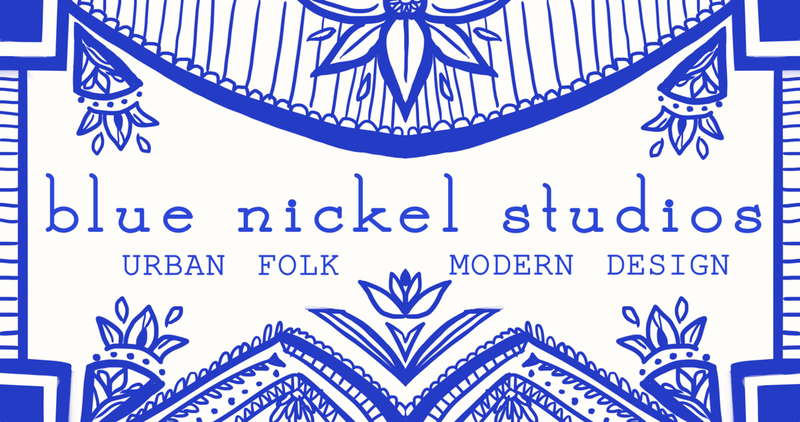 The story of the Blue Nickel Studios name is one that I get asked often. A long, long time ago, I was working in a retail environment that part of me liked …. and part of me didn’t. It put food on the table and a roof over our heads, but it wasn’t making us money hand over fist and it was … well… usually kind of boring. As the world got more automated and computerized, the goals of the company for the aesthetics around me, got more …. boring and much less artistic than it already had been. I was CRAVING a more artistic outlet. Well, one day, I found this nickel with blue paint on one side and red paint on the other side in one of the cash registers. And for some strange reason this blue nickel fascinated me. And I thought, hmm.. 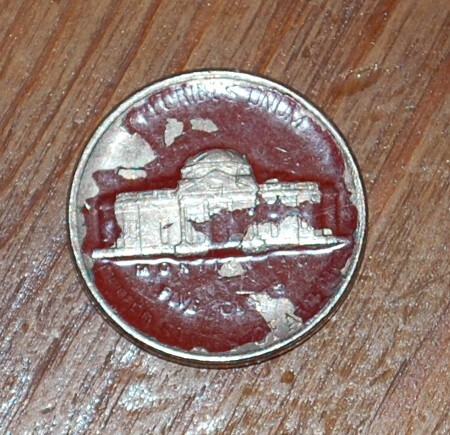 The Blue Nickel….sounds like a tavern or some other “third place” meetinghouse…..(and it does, doesn’t it??) Now, I should also note that I had been dreaming of opening a Quilt Shop (one of the best kind of third places) for years already but NEVER had the capital to start such a venture. 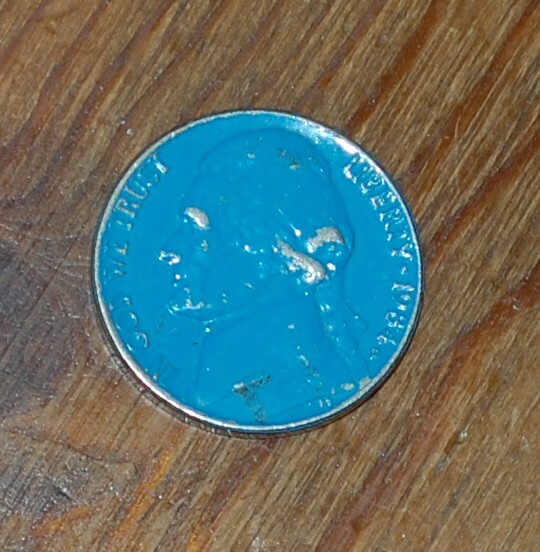 When I found this blue nickel, I said to myself, “Wouldn’t The Blue Nickel be a great name for a quilt shop? Sounds more Mysterious and Intriguing than a typical Scott’s Quilt Shop right?” But again, the money coming in was really just barely enough to take care of our family of five, let alone start up a quilt shop. I bought that nickel from the register anyway and kept it to keep the dream going … or at least to give me something creative to dream about. Fast forward a few years, I had begun designing quilt patterns for other people to follow (I had been making my own stuff up for years already, but now I was actually getting patterns in magazines and online with manufacturers). By that time, the dream had changed, I would much rather design and create patterns than own and run a Quilt Shop….although it would be a more creative environment than my retail job, I was sure that RUNNING one would take a lot more time managing and doing non creative stuff unless I could afford to hire someone else to do those parts, and that STILL wasn’t the case….. Anyway, I needed a name for my blog and the design company that I dreamed would eventually grow from that…. I still had that blue nickel… …And I thought about The Blue Nickel over and over again. I didn’t want to limit myself to just quilt patterns though….what if I want to add other creative textile-y things?? What if I wanted to design fabric or furniture or something? So that’s why I added the Studios bit….. I made the business/blog name plural and just a wee bit ambiguous and open to other avenues of exploration….. The story is not over by any means…..many things are still coming…..It’s just that I don’t know always what the next day, week, month, year is going to bring…..and that, I think, could be a very fine and maybe even an adventurous thing. Oh, and I still have that nickel – so the dream goes on…….